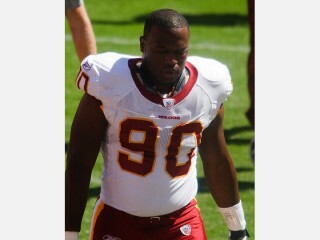 Jeremy Jarmon is an American football defensive end for the Washington Redskins of the National Football League. Jarmon is a talented prospect who had substantial playing time as a rookie in 2009 before his season ended with a knee injury. He was a standout at the University of Kentucky, where he started 31-of-39 games, totaling 17.5 sacks. * Played in 11 career regular season games. * Played in 11 games in his rookie season. * Recorded nine tackles and one forced fumble. * Sustained a knee injury at Philadelphia (11/29) and was placed on Injured Reserve on November 30, 2009. * Made NFL debut at defensive end at NYG (9/13). * Totaled a career-high two tackles (two solo) and his first career forced fumble on RB Clifton Smith to help secure a win vs. Tampa Bay (10/4). * As a redshirt junior was named second-team All-SEC by Phil Steele’s College Football and an honorable-mention performer by The Associated Press. * Was a quarterfinalist for the Ronnie Lott Trophy as the National Defensive Player of the Year. * Totaled 38 stops while starting 12 games. * Also contributed 10 tackles for a loss, 4.5 sacks, six pass breakups and two forced fumbles for the season. * As a redshirt sophomore, was named first-team All-SEC by Rivals.com and second-team All-SEC by league coaches. * Shared team Most Outstanding Defensive Player award with Wesley Woodyard. * Totaled 62 tackles, fourth on the team. * Fourth in the SEC in quarterback sacks with nine. * Tenth in the league in total tackles for loss with 13.5. * SEC Defensive Lineman of the Week in the win over Vanderbilt. * Matched a career-high with 2.5 sacks against the Commodores, including a critical sack in the final minute to help secure the win. * Set a career best for tackles with 10 stops in the win over No. 1 and eventual national champion LSU. * Played in all 13 games, starting six during redshirt freshman season. * Tied for second on the team in tackles for loss with 6.5. * Redshirted during first season at Kentucky and earned the Defensive Scout Team Player of the Week honor in helping the team prepare for the win over Vanderbilt. * Three-year letterman and two-year starter at Houston High School in Germantown, Tenn.
* Collected approximately 50 tackles, including 20 tackles for loss, and 10 quarterback sacks while also causing several fumbles. * Helped lead team to a 10-3 record, reaching the quarterfinals of the Class AAAAA (largest classification) playoffs. * All-district, all-region, and honorable-mention all-state. * Played fullback and tight end on offense. * Named to the Shelby County metro elite team by the Memphis Commercial-Appeal. * Graduated from high school at age 17. * A budding actor who portrayed a lead role in two theatrical productions, including Colonel Jessep (the Jack Nicholson role) in “A Few Good Men”. * President of the Pamoja Diversity Club, also a member of the Thespian Honor Society and French Club. * Son of Donald and Susie Gassett. * Majored in political science. * Considering a career in public service, perhaps in politics or the FBI after finished with football. View the full website biography of Jeremy Jarmon.